When the college choices of the Punahou class of 2014 appeared in the Winter 2014 edition of the Punahou Bulletin I wondered … how did their choices compare to the choices Punahou74 made forty years before? For many years the Punahou Bulletin has published an annual report of its recent graduates that lists their self-reported colleges and universities attended and other plans. The list makes for interesting reading and gives a snapshot both of the current “hot schools” and insight into the regard that colleges hold for Punahou School applicants. For example, only one Punahou74 graduate was heading to Radcliffe and none to Harvard. (Radcliffe would be formally integrated into Harvard by 1999.) By comparison six Punahou14 graduates were headed to Harvard. Quite a forty year turnaround in Cambridge, Massachusetts you might say. 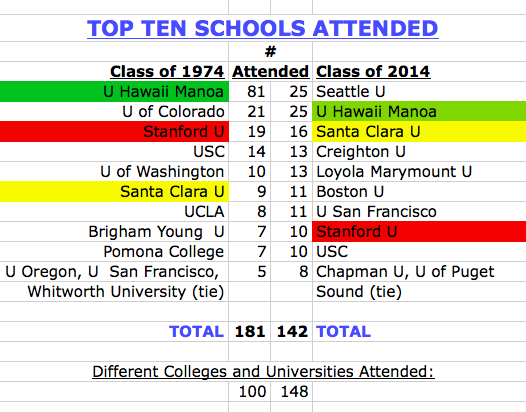 What other college changes have happened at Punahou in forty years? 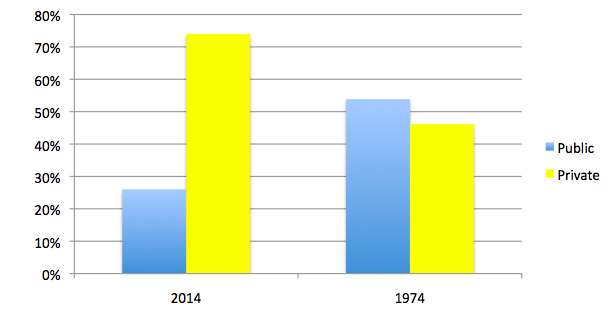 Did Punahou14 parents get more bang for their Punahou tuition buck? Take a look at the numbers. 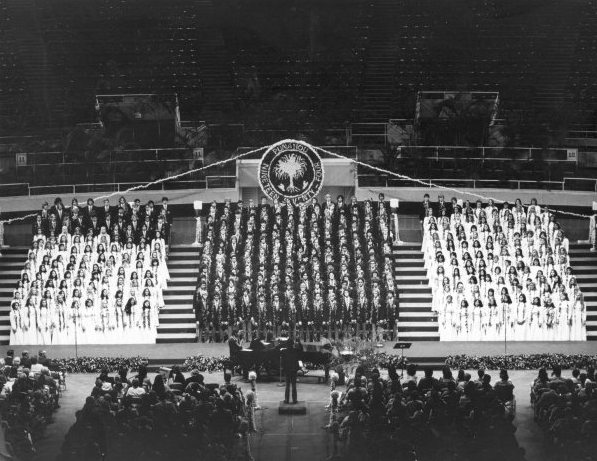 The Punahou74 stage held 407 graduates. By 2014 the stage was a bit more crowded when 436 graduates took their seats. In terms of smarts the classes were equal. Each class boasted 32% of the Hawaii National Merit Semifinalists; 5% of the students in each class was a Semifinalist. Punahou74 on the graduation stage at the Honolulu International Center. Although it’s now called the Blaisdell Center 2014 was graduating on the same stage. Any full-time student who averages a B+ (3.333) for any given semester, with at least a B in Citizenship will qualify for the “Dean’s List.” Students who have distinguished themselves by maintaining a consistently strong record of academic performance and honorable conduct during their high school career will be eligible for the privilege of being considered for Graduation with Honors if they meet these conditions: Students who enter the Academy in grade 9 must earn the Deans’ List for six semesters, and students who enter the Academy in grade 10 must earn the Deans’ List for five. — Punahou School Handbook 2010-2011: 56-57. 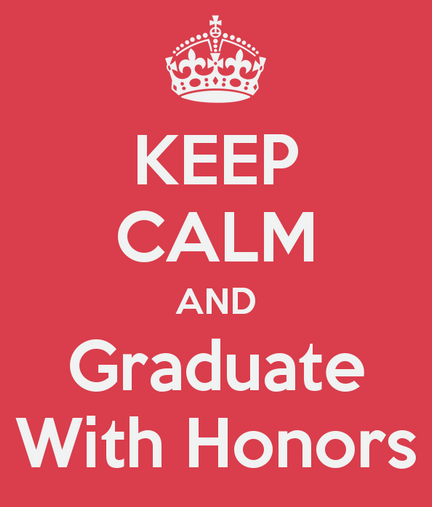 Could it be that the growth in “With Honors” graduates may be tied to changes made in Honors qualification? 1974’s physical education or sports grades did not figure into their GPA while 2014’s includes these marks. Hmmm. So that’s how those college admissions GPA’s have risen. 3.9 unweighted for Harvard? Not so hard. I chatted with an academy administrator about the rise in Honors graduates and was told that Punahou now tries to recognize student achievements beyond the pure academic when assigning a letter grade. A teacher also told me that he has never been told to limit the number of any grade awarded. If he thinks everyone did “A” work–and can substantiate it–he can award each student an “A.” Okay. But this is an academic honor so why would one go beyond academics to recognize Honors achievement? After all, does reading a book help you become All-State in football? So, for all of those hard working Punahou74 students, what did they get for their hours in the laboratory and the library? While six who attained Honors status did not state their post-Punahou intentions, those who were headed for college were headed for some great schools. As expected, honors status made it easier to get into a “dream” school but is not dispositive. Sometimes those extra curriculars or teacher recommendations can make a difference. 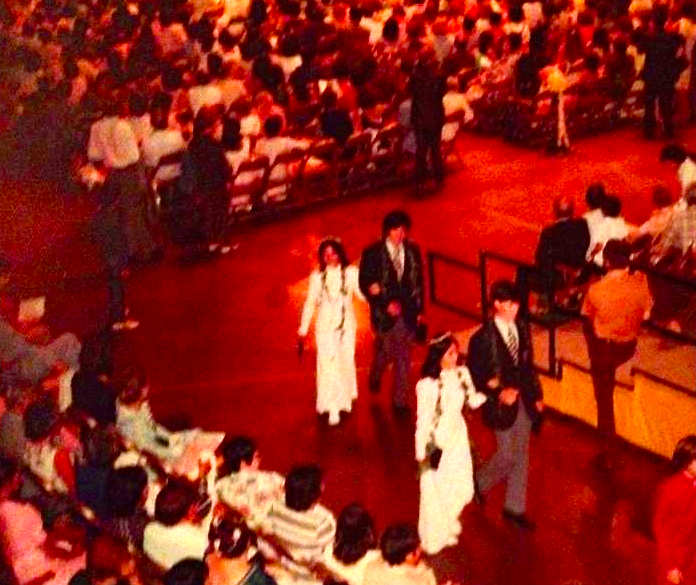 I did not match Punahou14 Honors graduates with their college choices but would imagine that such status would widen one’s college choices as it did for those in Punahou74. 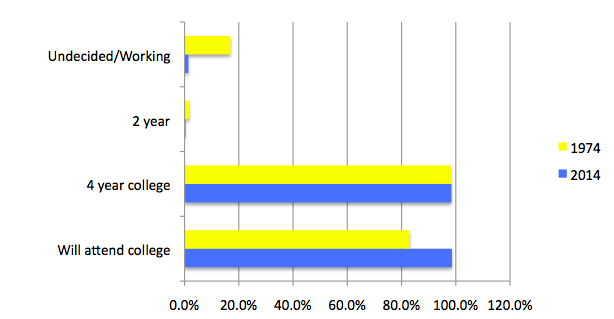 Of course, you’d expect honors kids to head for college but what about everyone else? 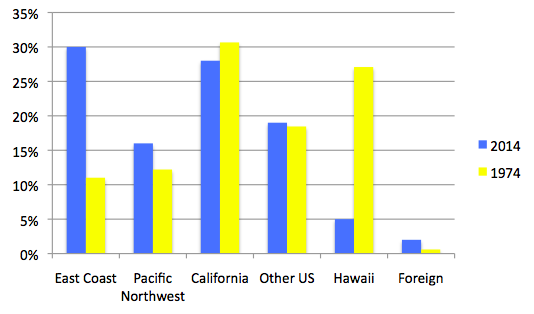 I am happy to report that, over the years, going to college has become a more popular post-Punahou choice. I guess there’s more college in that college prep aspect of the school! At 98.6% almost every Punahou14 graduate plans on attending college with all but one opting for a four year institution. This is significantly more than the 83% who reported a college choice in 1974 (most were again headed to four year schools). For those who had no college plans in 1974 37 were undecided and 32 were planning to travel or work. Six in 2014 held similar intentions. Where public institutions once were favored, Punahou graduates now prefer private institutions by a three to one margin. Much of this difference is related to the declining popularity of the University of Hawaii as a choice (see below). While Horace Greely may have favored the West as the land of opportunity, Punahou14 thinks otherwise with more of them heading East. When I went to Massachusetts-based Mount Holyoke college in 1974 not only did I know the three Punahou74 classmates who were there with me (Deanie Kuwasaki, Gail Ikinaga, and Tucker Dacey) but I also knew the thirty-three who were in the region. Today I’d have to know 129 others: a challenging task but one made easier in today’s facebook-enabled world and excellent fodder for the weekend roadtrips that were rampant in my day. Memories aside. I wonder if the availability of cheap airfares (my airfare to South Hadley was $550, 31 years later I paid $750 for my daughter to take the same trip) and zero-cost phone calls have dulled the daunting prospect of an eight hour flight to Chicago followed by two hours to Hartford, New York, Boston, or Philadelphia. Why stay in Hawaii when Mom and Dad can afford to fly you back home for Thanksgiving? Again, the University of Hawaii’s popularity has suffered as the ability to access mainland opportunities has increased. So what were the hot schools? College change in 40 years at Punahou? Yes. Absolutely. OK wait just a minute…Creighton was on the mind of at least one ’74 graduate! As a Junior I was planning on going their for the basketball program. No, didn’t play JV or Varsity at Punahou but played in off campus leagues and thought I had the skills. Creighton was a basketball powerhouse at the time. By the time Senior year came around plans changed. Best buddy Rob Hogan (’74) and I decided we were going to a private college in Southern Cal to play football…LaVerne. We were both accepted but when I digested the tuition I decided to compromise with my Dad who was a politician and tried to get his congressional friends to give me an appointment to one of the service academies which I did not care for. I enlisted in the Air Force and it was probably the best decision I ever made. It is still paying dividends today. It led to a 25 year career in the fire/ems service where I encountered the good & the bad society had to offer. It led to using my “political” blood I got from my Dad to get into the advocacy/lobbying field for federal wildland firefighters where I still deal with members of Congress everyday! Probably what led to my quadruple bypass in ’09! Anyway, some of us knew of Creighton 🙂 Much Aloha to all. If anyone has mainland friends who want a quiet get-a-way on the Big Island in a modest but beautiful home on a gorgeous acre south of Hilo, please let me know. They can look at the property (which I hope to move to someday) at hawaiiholidayvacations.com and type Hale Kauka into the search box. Book signing/Reading/Q&A This Sat 1pm Barnes & Noble Ala Moana. Pls come w/ friends! Would appreciate the support!! His email is……. konowong@gmail.com…….. drop him a line…..say Howzit! Fascinating insights! Where did you find where the kids went to college online? I cannot find the details. My main question as a prospective parent is: what if you go to Punahou and you don’t get into Harvard? Wouldn’t it have been better to just go to a good public school instead and save your $275,000 from kindergarten to 12th grade? The information is not available online but is communicated to alumni each year. That is where this was sourced. With regard to getting into Harvard because you went to Punahou … Harvard will only take so many from each class as will any school. So, just because you got into Punahou there’s no guarantee that you will get into Harvard from a pure numbers perspective. But Punahou may improve your chances of acceptance because Punahou has established relationships with the major colleges and universities. If money is a problem though go to public school then transfer. The diploma and the transcript will be from Punahou … and that’s what the college is looking at.